In a paper published in the Journal of Spacecraft and Rockets, engineers from the University of Glasgow and Oles Honchar Dnipro National University in Ukraine discuss how they have built, fired, and for the first time throttled up and down an 'autophage' engine which could change how small satellites are sent into space. Today, most rockets use tanks to store their propellant as they climb, and the weight of the tanks is usually many times greater than the weight of the useful payload. This reduces the efficiency of the launch vehicle, and also contributes to the problem of space debris. However, a launch vehicle powered by an autophage engine would consume its own structure during ascent, so more cargo capacity could be freed-up and less debris would enter orbit. The autophage engine consumes a propellant rod which has solid fuel on the outside and oxidiser on the inside. The solid fuel is a strong plastic, such as polyethylene, so the rod is effectively a pipe full of powdered oxidiser. By driving the rod into a hot engine, the fuel and oxidiser can be vaporised into gases that flow into the combustion chamber. This produces thrust, as well as the heat required to vaporise the next section of propellant. Simply by varying the speed at which the rod is driven into the engine, the researchers have shown that the engine can be throttled – a rare capability in a solid motor. Currently, the team have sustained rocket operations for 60 seconds at a time in their lab tests. Dr. Patrick Harkness, senior lecturer at the University of Glasgow's School of Engineering, leads Glasgow's contribution to the work. Dr. Harkness said: "Over the last decade, Glasgow has become a centre of excellence for the UK space industry, particularly in small satellites known as 'CubeSats', which provide researchers with affordable access to space-based experiments. There's also potential for the UK's planned spaceport to be based in Scotland. "However, launch vehicles tend to be large because you need a large amount of propellant to reach space. If you try to scale down, the volume of propellant falls more quickly than the mass of the structure, so there is a limit to how small you can go. You will be left with a vehicle that is smaller but, proportionately, too heavy to reach an orbital speed. "A rocket powered by an autophage engine would be different. The propellant rod itself would make up the body of the rocket, and as the vehicle climbed the engine would work its way up, consuming the body from base to tip. "That would mean that the rocket structure would actually be consumed as fuel, so we wouldn't face the same problems of excessive structural mass. We could size the launch vehicles to match our small satellites, and offer more rapid and more targeted access to space. 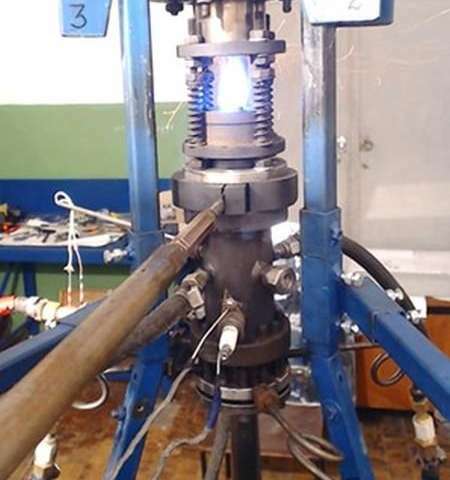 "While we're still at an early stage of development, we have an effective engine testbed in the laboratory in Dnipro, and we are working with our colleagues there to improve it still further. The next step is to secure further funding to investigate how the engine could be incorporated into a launch vehicle. The paper, titled 'Autophage Engines: Toward a Throttleable Solid Motor', is published in Journal of Spacecraft and Rockets. Why are reusable rockets so hard to make? In HS, with my Explorer BSA Post sponsored by FMC, someone flew a hybrid rocket of a poly tube with O2 flowing through the lumen after ignition with propane mixed in. Now this is thinking outside the box (quite literally). Awesome. This might be a really good idea. I would like to see a working model of the engine crawling up the body rather than being fed a tube, seems like preventing binding and controlling craw speed while not allowing combustion gases to escape the wrong way against meltable and flexible plastic might be a bit of an engineering challenge. I suspect the solution involves triangles and self sealing stem bolts. Also liquid rocket fuel being a liquid has a much lower potential energy density than a solid material. I'll let some other tell us what the combustion pressures within a hybrid rocket engine might be. However, when the wall thickness of the engine is less than a certain thickness the engine blows itself apart. Anybody care to sit on top of that rocket? It's the oxidized that weighs more. More than anything, this illustrates how we need to get past rockets, or expanding gas propulsion systems. Rockets are so last century. There is considerable evidence to show this happened, if one cares to look deep enough. Dismissal from those without the scope of mind to do that looking, is easy to come by. What we end up with is the Dunning-Kruger effect playing out in the sciences ...partially via the denial that there is an entire other branch of purposely hidden technology that surpasses the common rocket, and surpasses it by leaps and bounds. Hiding it has worked quite well. Add in the watchdogs and their continual denial barking.., and bob's hidden technology game is yer uncle. The given groups involved have so many reasons (both altruistic and horrifically selfish) to keep it hidden that it may be decades before we see how much we've been duped. In the meantime, the world is in serious trouble, and this "high tech blocking' is notably part of the issues at hand. To say I am disappointed with this apology for space propulsion engine is an understatement and that's before we get to the cannibalism stage, well maybe on reflection that's the best bit! This reminds me of Lutz Kayser's OTRAG rocket design, which was optimised for low cost. I wonder which one is better.